St James Orchestra was formed in 1964 to accompany a performance by a church choir and thereafter developed an identity of its own. Our rehearsal is Wallneuk North Church, Abercorn St, Paisley PA3 4AB. 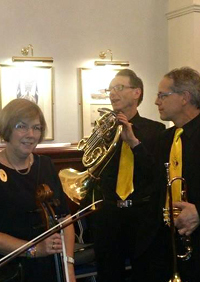 In 2014 the orchestra celebrated its Golden Jubilee. Read more here! The orchestra is run by an elected committee of members – the leader and the conductor are members of the committee ex officio.